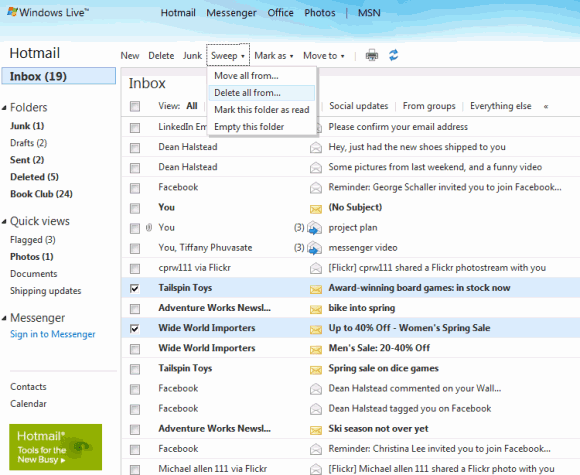 Hotmail, Microsoft’s webmail service, has improved a lot in the past two years. Hotmail is now a modern web application that no longer traps users’s data and focuses on important things like speed, usability, fighting spam and integrating with other communication services. The latest Hotmail update, that will be released as part of Windows Live Wave 4, tries to show that Microsoft finally managed to develop a better email service than Gmail and, in many ways, succeeds. Hotmail improved its spam detection algorithms and it’s now able to tweak some parameters based on your actions. Hotmail can now flag messages as spam even after you’ve received them. Another interesting improvement is that Hotmail categorizes messages, so you can quickly find the messages from your contacts, messages from mailing lists or notifications from social networks. Hotmail no longer has limitations for email storage and the main reason is that large attachments can be stored in Windows Live SkyDrive. “With Hotmail, we’ve combined the simplicity of sending photos through email with the power of Windows Live SkyDrive so that you can send up to 200 photos, each up to 50 MB in size, all in a single email. You can send all your vacation photos at once without worrying about attachment limits,” explains Microsoft. This is an important feature that’s missing from Gmail and it’s surprising that you can’t upload photos to Picasa Web Albums or upload documents to Google Docs directly from Gmail. Microsoft also integrated Hotmail with Office Web Apps, so that documents can be previewed and edited online, without having to install an office suite. Now that attachments are stored in a single place, the total attachment limit for a message is 10 GB, while Gmail offers about 7 GB of storage for all your messages. Hotmail added many of the features that used to be available only in Gmail: conversation view, full session SSL, watching YouTube videos inline, but Microsoft managed to make some improvements. The active view feature doesn’t work only for YouTube, it’s enabled for many other sites (Facebook, Twitter, LinkedIn), so you can accept invitations or reply to a Twitter message directly from Hotmail. There’s also a feature that lets you create a single-use password for signing in on public computers. 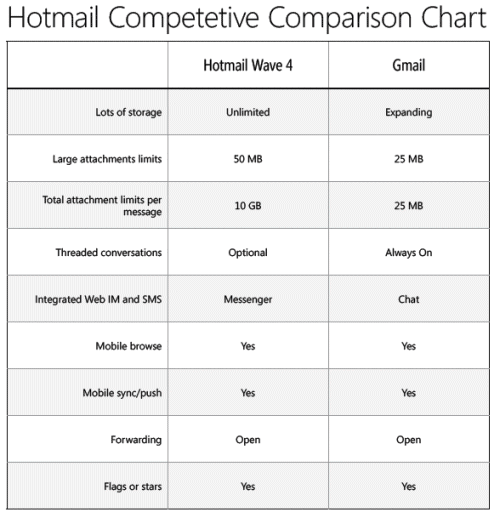 Google has a lot to do to catch up with the new Hotmail, but that’s a good thing. Competition is what makes products better.